Insulated packaging comprises the combination of materials which have low thermal conductivity and are heat-resistant or poor conductors of heat. Insulated packaging is mainly used for shipping of temperature-sensitive products for maintaining product freshness and efficiency. This type of packaging is required in those industries dealing with temperature sensitive products such as food & beverage, chemical, personal care, and healthcare as it protects the product from fire or explosion hazards. Insulated packaging plays an important role in minimizing the effect of variable temperature, maintaining product specifications or keeping the product warm, frozen or refrigerated, and protecting the product from physical damage. The characteristics of insulated packaging are high resistance to heat transfer by conduction, convection or radiation, ease of fabrication & transportation, low cost, low weight, low moisture susceptibility, durability, and mechanical strength. The insulated packaging has witnessed major demand from the overall packaging industry, because of its wide application scope. It has been predicted that the global insulated packaging market will grow with an approximate CAGR of 5.68 % by 2023. Rapid increase in global population is inducing high demand for various products with improved shelf life. Insulated packaging provides the contents with protection against the damage caused by heat. Increased production of temperature-sensitive products in various industries such as food and beverages, pharmaceutical, cosmetic and others is inducing high demand for insulated packaging solutions, resulting in the expansion of the global insulated packaging market. With the introduction of high quality, lightweight materials that provide insulation to the packaging, the demand for insulated packaging is increasing in various industrial sectors, which in turn is propelling the growth of the global insulated packaging market during the assessment period. However, availability of alternatives for insulated packaging, high cost of temperature-sensitive products and government regulations regarding the production of plastic-based packaging are likely to restrain the growth of the global insulated packaging market during the forecast period. The global Insulated Packaging Market has been segmented on the basis of material, packaging type and application. Based on material, the insulated packaging market has been segmented into glass, plastic, wood, cupboard, and others. Based on packaging type, the insulated packaging market has been segmented into box & container, flexible blanket, bags, wraps, and others. Based on application, the insulated packaging market has been segmented into food and beverage, industrial, personal care, healthcare and others. Among these, the food and beverage segment is expanding with a significant market share in the global insulated packaging market. 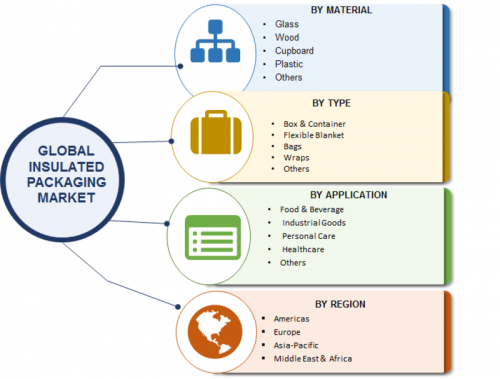 Geographically, the global insulated packaging market has been segmented into four major regions such as Asia Pacific, North America, Europe, and the Middle East and Africa. The Asia Pacific region is market to project dominance over the global insulated packaging market. High demand for insulated packaging in rapidly developing pharmaceutical and food and beverages industries is majorly driving the insulated packaging market in the Asia Pacific region. In North America region, the insulated packaging market is majorly driven by the increasing demand for ready-to-eat food products, high-quality cosmetic products and other materials that require insulated packaging in this region. Increasing utilization of insulated packaging in the pharmaceutical is majorly driving the insulated packaging market in the Europe region. In October 2018, Borealis, an Austria-based leader of innovative solutions in the field of base chemicals, polyolefins and fertilizers, has announced a strategic alliance with Bockatech, a U.K. based provider of patented EcoCore technology which is a new plastic molding technology for sustainable insulated packaging.